Please consider making a small donation so that I can continue to offer free patterns. Thank you! These ornaments can be modified for different looks. 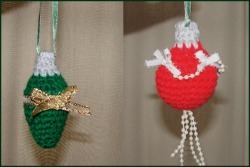 Christmas Ornaments are worked in WW yarn and can be decorated as desired.